Rigatoni with Arugula PestoIn some ways, April is the cruelest month for seasonal eaters. The sun is shining, bars are reopening outdoor seating, upper arms are freshly exposed—stuff should be popping out of the ground, right? Well, not really. Stuff is going into the ground, and, for the most part, we're still stuck with apples, potatoes and those darn carrots. And greens. This is the bright spot. The harbinger. The arugula is arriving tender and spicy, and the green garlic is out-and-about, confusing everyone with its scallion-like appearance. Last night, I went to the fridge and furrowed my brow. Besides breakfast staples (milk, eggs, Country Time bacon), there wasn't much going on. But there was a small cache of arugula, looking only the tiniest bit wilty. I threw the green gold into the food processor with a glug of good olive oil, two bulbs of green garlic, a squirt of lemon and a pinch of salt. I then spooned it into a bowl and shaved some parmesan on top (you don't want to add the cheese in the food processor; the heat from the blade compromises the character of the cheese.) 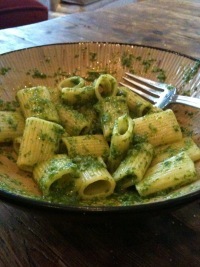 The resulting pesto was intense, bitter and verdant—really delicious stuff. Arugula pesto (which also makes an excellent sauce-like topping for pizza) is fun for lots of reasons, but I really love the element of surprise. Though it looks almost identical to basil pesto, the flavor calls to mind an evil twin, zigging where the sweet basil usually zags.